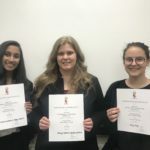 University of Lynchburg psychology majors took first- and second-place honors April 17 at an undergraduate research symposium hosted by Virginia Military Institute’s Center for Undergraduate Research. 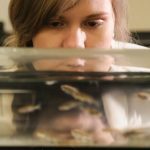 In Lynchburg College’s Physiological Psychology Lab, the zebrafish are exercising. No, the striped, guppy-like fish aren’t doing step aerobics in tiny sneakers, but what they are doing is helping a team of researchers learn about the effects of exercise on anxiety.